I headed off to the local thrift store to find a DC motor to drive a rotating platform. My first thought was that it needed to be strong enough to rotate a platform with a little weight. I found a rechargeable (name brand) drill for $2 which is probably overkill for power, but it should suffice. Aside from discharged batteries the drill actually worked and the batteries would still hold a charge. Now I need to find a small wheel with a shaft on it to chuck in the drill and press on building an oven platform. Maybe I can find one from a kid's toy car or something. Okay I admit I already have a feasible power source for charging the batteries, but am debating on which to use. 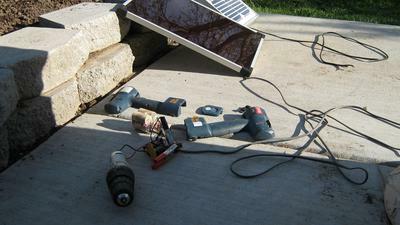 I have a few solar panels, a 5W amorphous, 10W crystalline and a small household battery charger type. I'll use the small one toggle a relay that provides power to the motor. Unlike the crystalline type, the amorphous panel will still output some power even when partially blocked to maintain charging the batteries. As for controlling the motor drive direction I don't think that's an issue. I don't intend to move south of the equator anytime soon unless someone wants to buy me an island in the South Pacific. It's a work in slow progress, but I'm in no hurry. This will be interesting to see how it turns out. I know there are others who will also be interested in the progress and results of this project. Had a couple of days off last week to experiment and realized the motor from the drill was a bit of over kill. My isolation relays to turn on/off the power worked, but the setup didn't totally isolate the power to the motor fast enough. In addition without the battery pack the drill motor requires much more energy that both of my solar cells combined can provide to get it started. Then as an afterthought, I believe the proper 'green' setup for a motor driven tracker shouldn't require any batteries if you want to make it self sufficient. The motor needs to be able to drive at a much slower speed. DUH? Brain fart? Bottom line is that the whole thing shouldn't be that complicated or heavy if you want to use your sun oven daily. It should be just as portable as the oven. My next goal is to search for a set of small, cheap, durable ~5w solar panels to pursue this venture.